This is a dual housing system that can be installed under the sink. All fittings, hoses and tap are included. Many rural and farm water supplies are from sources other than rain water. This system is designed to treat water from springs and bores where the water is reasonably well protected but where it may have come into contact with the ground. The first cartridge in this system is a relatively fine carbon block cartridge designed for protection against water borne protozoan pathogens. An example is the KX Matrikx Cr1 carbon block cartridge. The second cartridge is a ceramic cartridge usually the Doulton Sterasyl cartridge. 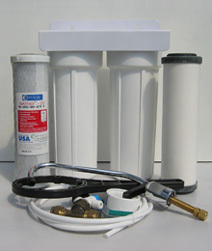 For disinfecting water sourced from relatively unprotected surface waters such as creeks and dams we recommend the Rural drinking water UV system.